Q: We have noted that a foreign ministers' meeting on the Iranian nuclear issue was convened at the UN Headquarters in New York which gathered together Chinese State Councilor and Foreign Minister Wang Yi, foreign ministers of Russia, the UK and Iran, the EU High Representative for Foreign Affairs and Security Policy, and the Director General of Department of Political Affairs of Germany's Foreign Ministry. The meeting published a joint statement. Could you offer us more information on that? A: On September 24 local time, State Councilor and Foreign Minister Wang Yi attended a foreign ministers' meeting on the Iranian nuclear issue at the UN Headquarters in New York. All participants discussed pathways to ensure the comprehensive and effective implementation of the Joint Comprehensive Plan of Action (JCPOA) and evaluated the progress made in identifying and executing practical measures to achieve that goal. The JCPOA is a multilateral agreement ratified by the Security Council. As a major outcome of multilateralism with the legal force of international law, it serves the common interests of the international community. To preserve and implement the JCPOA is to uphold the authority of the UN and the Security Council, the seriousness and sanctity of international agreements, multilateralism, the basic norms of international law, international nuclear non-proliferation regime and peace and stability in the Middle East. Just like State Councilor Wang Yi pointed out, the meeting carried four messages. First, the meeting expressed deep regrets over the US withdrawal from the JCPOA. Second, it recognized Iran's compliance with its nuclear-related commitments made in the JCPOA. Third, it reaffirmed commitments to continue to preserve and implement the JCPOA. Fourth, it was devoted to properly addressing difficulties in maintaining normal economic and trade cooperation with Iran. The joint statement issued by the meeting highlighted all participants' determination to protect the freedom of their economic operators to pursue legitimate business with Iran, in full accordance with UN Security Council Resolution 2231. All participants reaffirmed that they will continue to take effective measures to secure payment channels with Iran, and the continuation of Iran's export of oil and gas condensate, petroleum products and petrochemicals. All the participants welcomed the proposals to establish a Special Purpose Vehicle to facilitate payments related to Iran's exports and imports, including oil. The JCPOA's effectiveness has been proved by its implementation over the past three years. China supports all things that will help preserve the JCPOA. In the meantime, we will do our utmost to ensure China's legitimate and lawful rights and interests. Q: Do you have any further details on the agreement that China reached with the Vatican over the weekend? And more specifically, in the agreement is there a mention of the Vatican's relations with Taiwan and is there a timetable China expects the Vatican to abandon Taiwan and to establish diplomatic relations with the mainland? A: With regard to the provisional agreement on appointment of bishops signed between China and the Vatican, the Chinese side has issued the press release. As to how signing this agreement between China and the Vatican will affect Taiwan's so-called diplomatic ties with the Vatican, I want to say that the Chinese side is always sincere about improving its ties with the Vatican and has been making unremitting efforts in this regard. Reaching the provisional agreement on appointment of bishops on the part of China and the Vatican is an important outcome in the process of improving our bilateral ties. China is willing to continuously work with the Vatican to conduct constructive dialogue, enhance understanding, accumulate mutual trust and keep improving our bilateral relations. Q: According to Japanese media, member of the Political Bureau of the Central Committee of the Communist Party of China and Director of the Office of the Central Commission for Foreign Affairs Yang Jiechi co-hosted the fifth round of China-Japan High-level Political Dialogue with Japan's National Security Advisor Shotaro Yachi in Suzhou, Jiangzu on September 25. The two sides agreed on the denuclearization of the Korean Peninsula and the importance of implementing the relevant resolutions of the UN Security Council in a comprehensive way. They also agreed to maintain close communication in this regard. What is your comment? A: On September 25, the fifth round of China-Japan High-level Political Dialogue was held in Suzhou. Our two sides had a candid and in-depth exchange of views on China-Japan ties and international and regional issues of mutual interest. The Chinese side expounded its consistent and clear-cut position on the Korean Peninsula issue. 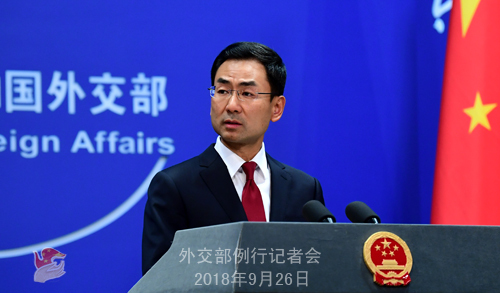 China is committed to achieving the denuclearization of the Korean Peninsula, maintaining peace and stability on the Peninsula and resolving the issue through dialogue and consultation. Meanwhile, China maintains that the relevant resolutions adopted by the UN Security Council should be implemented in a comprehensive and balanced manner. Under the current circumstances, all relevant parties should cherish and uphold the hard-won improving situation on the Korean Peninsula and play a constructive role in promoting the political settlement process of the Peninsula issue. Q: We have noted that a smart phone app "Foreign Ministry 12308" just got online. Could you give us more details about this app? A: On the sidelines of the annual session of the National People's Congress this year, State Councilor and Foreign Minister Wang Yi announced at his press conference that a smart phone app version of 12308 will be launched. Now, this app is officially launched as scheduled to complement the Wechat and weibo versions of 12308. They will simultaneously issue safety advisories, the handling of major consular emergency cases involving Chinese nationals, important Chinese and foreign visa regulations, and important policies and information concerning the issuance of consular documents for Chinese nationals. The most noteworthy feature of this app is that through it, Chinese nationals could make free 12308 helpline calls using the internet. There is no need to pay global roaming and call charges. This will make it more convenient for Chinese nationals who encounter difficulties overseas to receive consular protection and assistance from the Foreign Ministry and China's diplomatic missions at the earliest time possible. Chinese nationals are encouraged to download this app, and we look forward to hearing some valuable advice so that we could enrich and improve the functions and contents of this app. The National Day holiday which is a peak season for outbound visits is just around the corner. Here we would like to remind our Chinese nationals to mind travel safety issues, travel safely and with good manners, abide by local laws and regulations, respect local customs and practices, protect environment, and always remember they represent the image of China. Q: Yesterday, in his speech at the General Debate of the UN General Assembly, the US leader talked about the China-US trade war, saying that after China joined the WTO, the American companies and workers have been victimized and that the US will not tolerate China's acts any more. What is your response and what is your comment on the US leader's speech? A: The Information Office of the State Council has issued a White Paper on the Facts and China's Position on China-US Trade Friction. Yesterday, the Information Office of the State Council held a press conference to brief you on the situation and take your questions. You can see that China's position and attitude cannot be made more clear-cut. In response to the latest statement made by the US, I would like to make the following points. Firstly, the large trade deficit that the United States has with other countries and the loss of US manufacturing jobs are the result of the shortage of savings in the United States. It is the result of changes in the international division of labor and the production layout of multinational companies as well as using the US dollar as a major international currency. It is also an objective reflection of the complementary comparative advantages of the industries in the United States and those in other countries. It makes no sense to only blame China for the trade deficit and job losses, or attribute them to China's entry into the WTO. 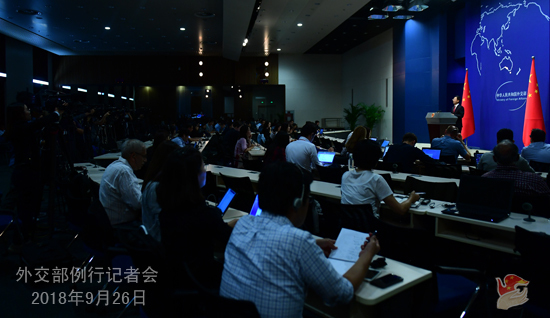 Secondly, with regard to the China-US trade friction, China's position has been made clear both in the White Paper and at yesterday's press conference. We have been stressing that the China-US economic and trade cooperation is mutually beneficial in nature. During the past 40 years or so, the China-US economic and trade cooperation has brought tangible benefits to our two peoples. It is only natural and also inevitable for our two countries to have some trade differences and frictions. The key is that our two sides should resolve them through dialogue and consultation on the basis of equality, good faith and mutual respect, instead of pursuing unilateralism and protectionism. Thirdly, the annual General Debate of the UN General Assembly is an important platform for the UN member states to expound their positions and propositions on the current international and regional situations and major international and regional issues. As an important country in today's world, the United States certainly has its own unique opinions and views on a host of issues. I think you all have noted that. Meanwhile, we hope that the United States will also take this opportunity to listen to the speeches made by the UN Secretary-General, the President of the UN General Assembly and other UN member states and heed their call for adhering to multilateralism, upholding the authority of the United Nations, promoting free trade, advocating international rules and strengthening global cooperation. As the world's number one power, the United States should think about what role they should play in helping resolve the international and regional hot-spot issues, addressing global threats and challenges and promoting world peace and development. Q: According to reports, former President of the Maldives Mohammed Nasheed, when giving an interview to Indian media, said that no project between China and the Maldives is commercially feasible and that unfeasible projects should not be imposed on developing countries. He added that the Maldives will audit infrastructure projects. He believes that the Chinese side can understand why the Maldives did so. What is your comment? 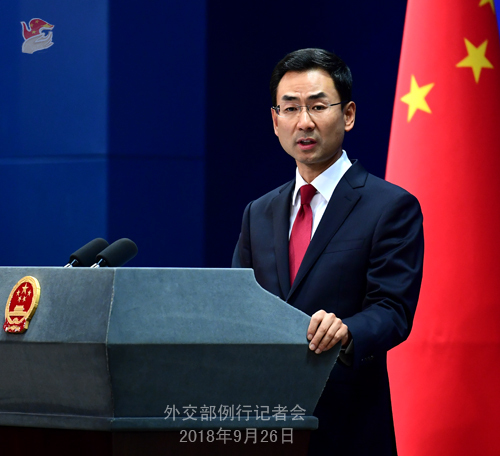 A: It is the people of our two countries that have the final say on whether the China-Maldives cooperation is feasible and can deliver benefits to our two countries. It can by no means smeared by certain people. It baffles me why certain people always make such irresponsible remarks and I deeply regret that. I would like to reiterate that the China-Maldives cooperation is based on equality, voluntarism and mutual benefit and strictly follows the market rules and observes laws and regulations. If certain forces wantonly harm China's interests out of political purposes, the Chinese side will firmly oppose it and resolutely protect the legitimate rights and interests of Chinese enterprises. Q: Yesterday, in the speech at the General Debate of the UN General Assembly, the US side heavily criticized Socialism, saying that Socialism and Communism produced suffering and corruption to mankind. All nations in the world should resist Socialism and the misery it brings to everyone. What is your comment? A: Every country has the right to choose the development path and social system which suit its needs. The people of one country are in the best position to comment on whether their development path and social system are suitable or not. Drawing lines according to ideology and creating hostility and confrontations between the two camps are the practices during the Cold War. Here I would like to remind you of the fact that the Cold War has been over for nearly 30 years. Over the past 30 years or so, the tide of the times has been vast and mighty and the wheels of history have been rolling on. I believe that the vast majority of countries in the world do not want to turn back the clock.